Zenedit plugin is an enhancement for rich-text fields in Redmine that allows editing the text in a full-screen mode. It helps you to focus on your work. The zen mode displays text with a bigger, well-readable font, so you don't need to make your eyes tired. You can apply any text formatting in a full-screen as well as use preview and submit changes without living the zen mode. The full-screen mode works across all Redmine, such as wikis, news, forum, issues, comments, notes, contacts and any other form of a text area. It can display text in default light as well as dark mode, which is great for working at nights or for people with more sensitive eyes. 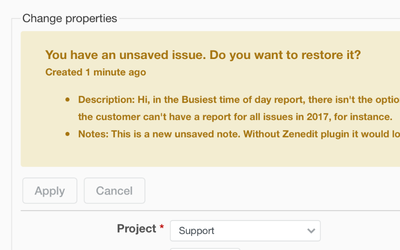 Now you can work on issue descriptions, comments or notes safe that you won't lose the results by accident. The plugin save the draft every 30 seconds, and if you leave the page without publishing the changes, it will show you the notification that the draft is available upon your return. You can mention Redmine users the same way as on Facebook, Twitter, or other social media. Use '@' character to trigger the mention and start typing the user's email. Pick the right one from the drop-down list. Once the note/comment/description is submitted, they will receive an email notification. User mentions makes communication and collaboration way simpler and faster. You don't have to add everyone as watchers and can limit the amount of generated notifications. 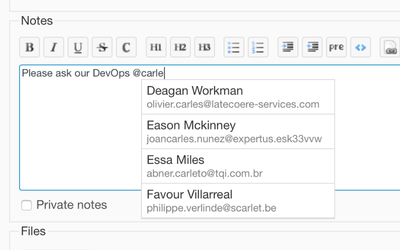 Plugins adds small button to every new rich-text area across the Redmine. Once clicked, it opens the field in Zen Mode, removing all distractions so you can focus entirely on writing. You can choose between two themes—light, or dark. To change your theme, use the switch at the top right corner of the window. To apply text formatting select text and hover to the top panel. 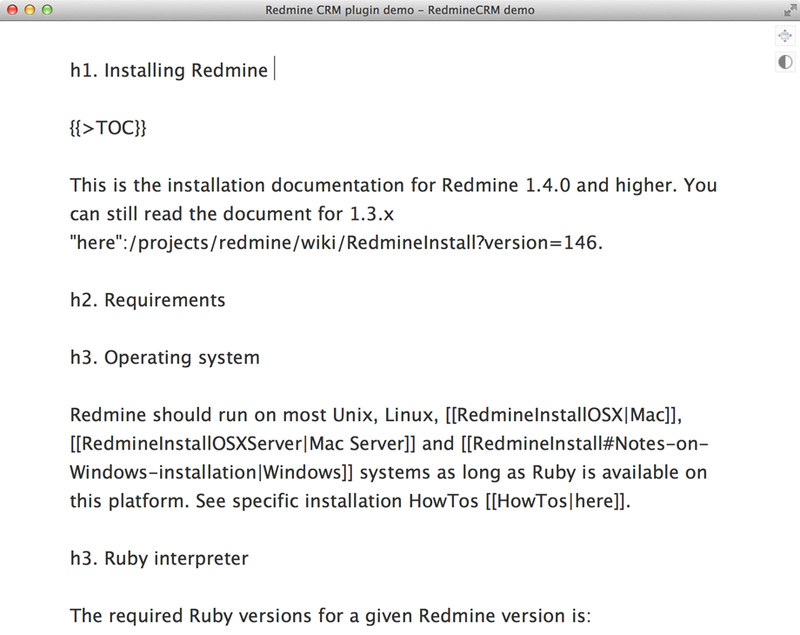 Compatible with Redmine 4.0.x, 3.4.x, 3.3.x, 3.2.x, 3.1.x, 3.0.x, 2.6.x. 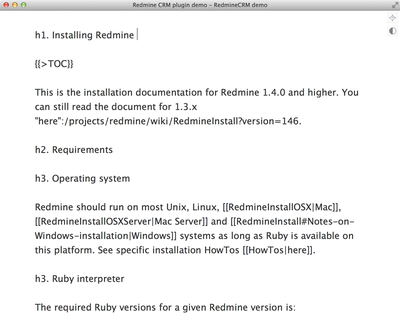 Compatible with Redmine 4.0.x, 3.4.x, 3.3.x, 3.2.x, 3.1.x, 3.0.x, 2.6.x, 2.5.x, 2.4.x. 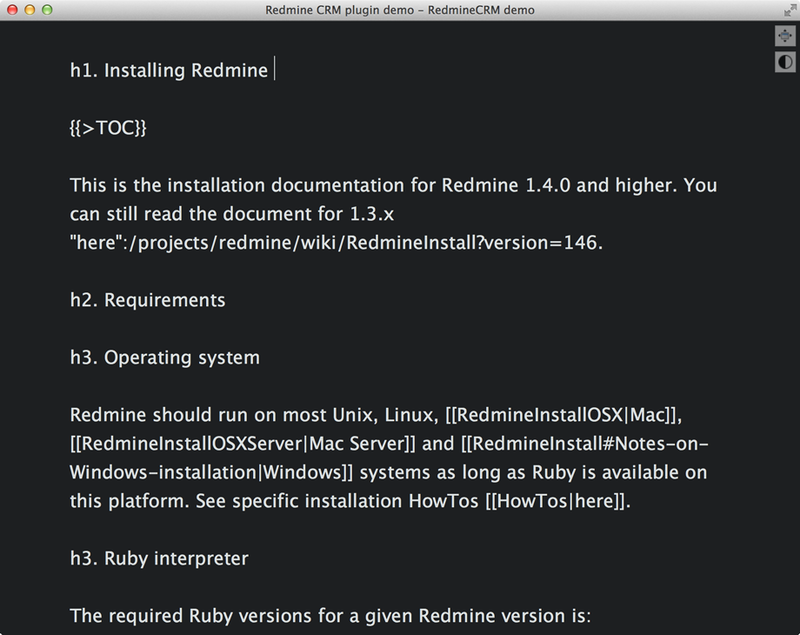 Compatible with Redmine 3.4.x, 3.3.x, 3.2.x, 3.1.x, 2.6.x, 2.5.x, 2.4.x, 2.3.x, 2.2.x, 2.1.x. Compatible with Redmine 2.3.x, 2.2.x, 2.1.x. I like this plugin but has bug with textile editor on windows. 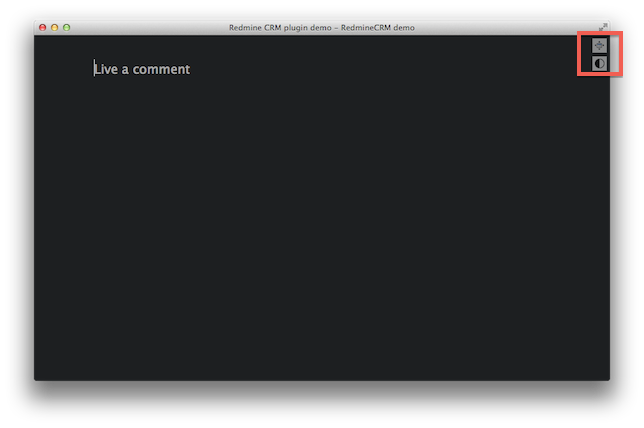 Works fine with markdown, but we use textile! Good idea. shame it only works on MAC and Linux distros. Many users have windows.